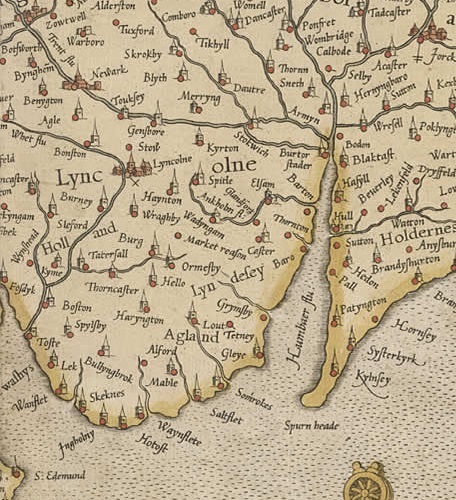 This post is primarily intended to share images of some of the interesting early maps of Lincolnshire that still exist, dating from the medieval era through until the early seventeenth century. Details of each map and a brief discussion of the principal points of interest—including the curious region-name 'Ageland' that appears in eastern Lincolnshire on many of them—are provided in the captions to the following image gallery, which I aim to add to over time. Map of Lincolnshire, extracted from the map of England by Matthew Paris, c. 1250. 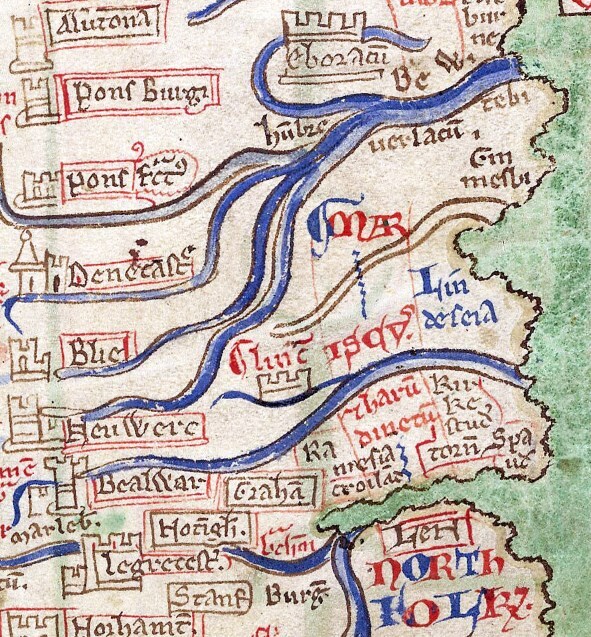 Norfolk is at the bottom with an thin depiction of The Wash above it and then the Holland district; the Witham and Humber (with its many tributaries) are depicted in blue with the district of Lindsey located between them (Image: BL Cotton MS Claudius D VI, fol. 12v, via Wikimedia Commons). 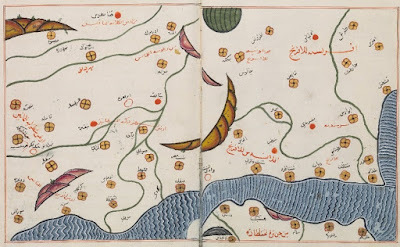 A map of England attributed to Genoese cartographer Pietro Vesconte in Marino Sanudo's Liber secretorum of c. 1325, based on his earlier portolan chart and mariners' reports; click for a larger view. The Wash is clearly visible as a deep, circular bay halfway up the eastern side of the island; however, whilst numerous ports are marked along the south coast of England and up the east coast as far as The Wash, Lincolnshire is left empty aside from indications of two rivers (the Witham and the Humber? ), with the first name inscribed north of The Wash probably representing Ravenserodd, the important thirteenth- and fourteenth-century island port near Spurn Head, East Yorkshire, that was destroyed by the sea in 1362 (Image: Wikimedia Commons). 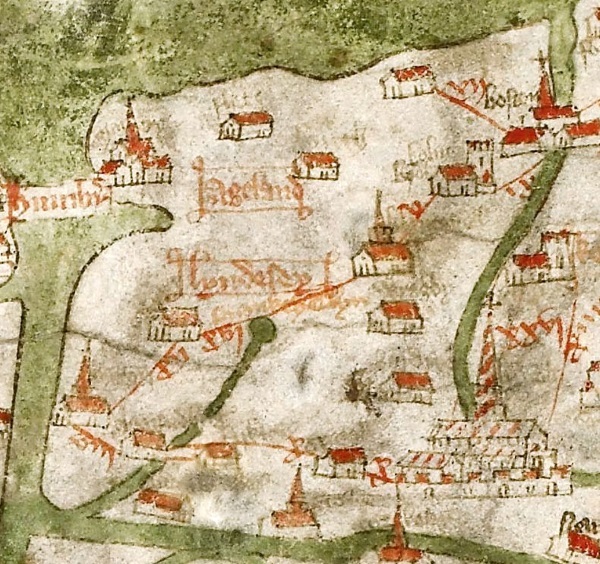 Close up of Lindsey (the northern district of Lincolnshire) on the fourteenth-century Gough Map, with north on the left and major roads, rivers and settlements marked. Lincoln is shown at the bottom right with the Trent running along the bottom edge of the image; Boston is at the top right; and Grimsby is at the top left, with the Humber then running down the left edge of the image. 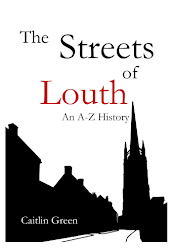 Note the curious name 'Ageland' assigned to roughly the area of the Wolds between Grimsby and Louth, being written in a very similar way to the district-name Lindsey. 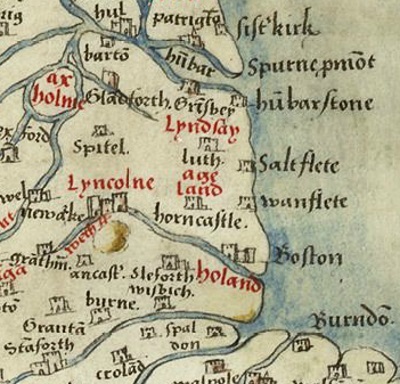 This name also appears in the fifteenth-century work of Osbern Bokenham, where it seems to again be associated with the Lindsey district of Lincolnshire (Bolingbroke is mentioned shortly afterwards), and it also appears on some sixteenth-century maps of Lincolnshire as a district-name for eastern Lindsey written in the area around Louth, as can be seen below. There are few discussions of this name and its import, sadly; the editors of the Gough Map assume it reflects the wapentake-name Aveland, but it is not clear why this wapentake-name alone would be highlighted like this nor why it would be spelled with a -g- here but nowhere else and then placed in totally the wrong part of Lincolnshire, Aveland wapentake being part of the southern Lincolnshire district of Kesteven, not north-eastern Lindsey (Image: Wikimedia Commons). 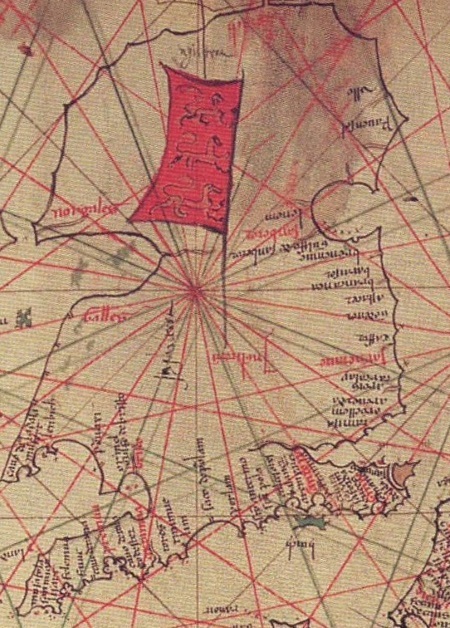 Extract from the Angliae Figura, a vellum map probably created in the 1530s and perhaps hanging at Hampton Court (included on the map) as the property of Henry VIII. 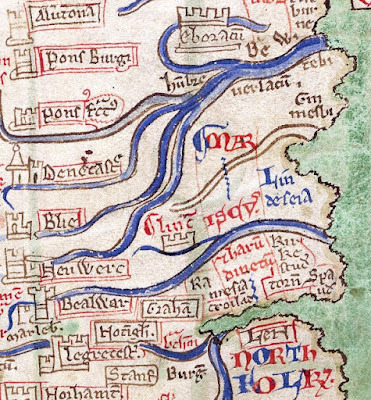 The coastline of Lincolnshire is clearly faulty between Wainfleet and Spalding, but is close to that seen on the Gough Map; both are thought to derive from a common source map dating from around 1290. As on the Gough Map, the curious name 'Ageland' appears highlighted in red as a major (?district-)name and is once again placed in eastern Lindsey, close to Louth (Image: British Library). 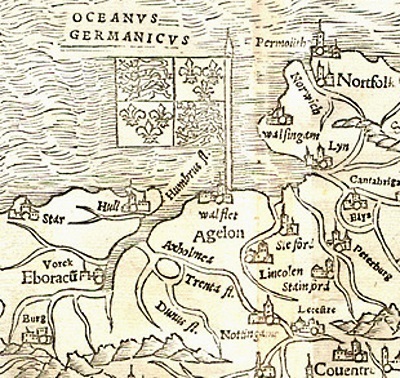 Extract from Sebastian Münster's 1540 map of Britain, showing Lincolnshire. The coastline appears derivative of the tradition of the Gough Map/Angliae Figure, but with more of an indication of The Wash than the latter (as is the case on the 1546 Lily map as well). Only the major rivers are shown along with just a handful of Lincolnshire place-names: Lincoln, Stamford, the Isle of Axholme, Sleaford and 'Walflet', which looks to be Wainfleet or a combination of Wainfleet and Saltfleet. Only two district names appear in Lincolnshire, Axholme and 'Agelon', the latter clearly being equivalent to the earlier 'Ageland' and written across Lindsey in a larger font than the other names, whilst the district-name Lindsey is left out entirely (Image: Lancaster University). 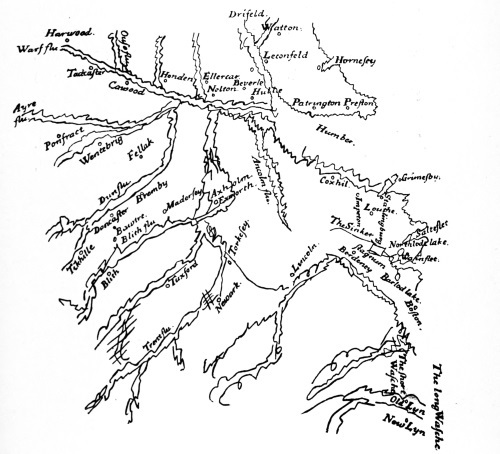 John Leland's sketch map of the Humber district, created c. 1544 to show the drainage basins of the Humber and Witham rivers. 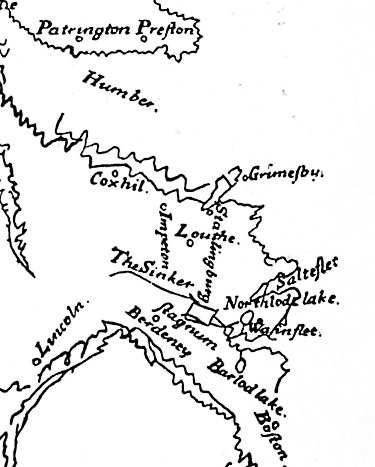 Leland's sketch includes a rough approximation of the coastline, rivers and key settlements of Lincolnshire; despite it being a rough sketch, the north and east coasts of Lincolnshire appear to be more realistically rendered than they are on the earlier maps discussed above, although his depiction of the northern Wash coastline continues to be in the Gough Map/Angliae Figura tradition (image: Sheppard 1912). Detail of eastern Lincolnshire from John Leland's sketch map of c. 1544, showing his attempt to sketch both Saltfleet Haven and the early Wainfleet Haven, including the latter's associated tributaries and lakes. Note, Northlod is also mentioned on the 1570 plan of the proposed New Cut at Wainfleet (Image: Sheppard 1912). Gerard Mercator's engraving of a map of Lincolnshire, originally produced in 1564 and put together into atlas form in the 1570s; north is on the right hand side for this map, which is thought to have been simply engraved by Mercator from an English original, possibly produced by John Elder to assist the French or Spanish in planning an invasion to overthrow Queen Elizabeth I. 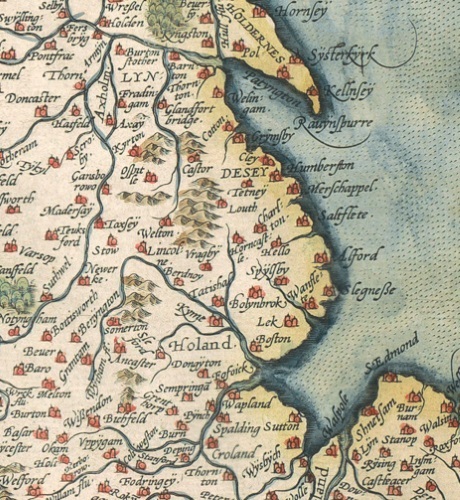 It is worth noting that not only does the map offer considerably a much improved coastline for Lincolnshire and more detail than many earlier maps, in terms of both rivers and settlements depicted (though Mercator seems to have misread some of the names on his original), but that it also once more includes the odd district-name 'Agland' in the area around Louth, despite the fact that the whole area had clearly been resurveyed. 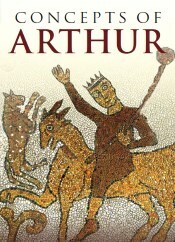 As was observed above, versions of this name also occur on the fourteenth-century Gough Map of Lincolnshire in approximately this position, in a fifteenth-century text relating to Lincolnshire, and on the earlier sixteenth-century Angliae Figura and Münster maps too; it also continued to appear on maps in the later sixteenth-century—being found on, for example, Gerard de Jode's 1578 and 1593 maps and on Sebastian Petri's 1588 map—and even appears on some seventeenth-century maps, as can be seen below (Image: British Library). Map of Lincolnshire drawn by Humphry Lhuyd before his death in 1568 and published in Abraham Ortelius's Atlas in 1573. The map shows the Lincolnshire Wolds for the first time and other areas of local high ground, along with major rivers and key settlements (Image: Wikimedia Commons). 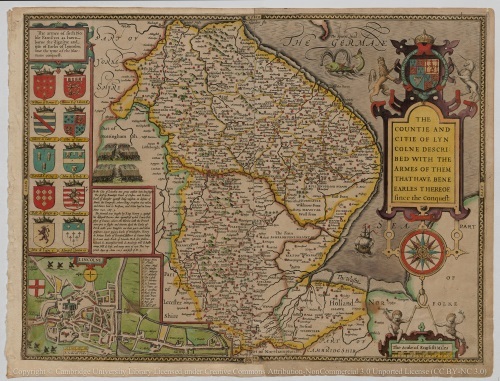 Proof version of John Speed's 1611/12 map of Lincolnshire, which closely followed the Saxton map of 1576 in offering a much more accurate and detailed depiction of the county; a zoomable version of this map is available here. Of particular interest on both maps is the fact that nearly every settlement in Lincolnshire is mapped and so too are the courses of most of the rivers; the latter are of especial note, given how much these courses changed over the following two centuries—note, for example, the original course of the Lud before its canalisation, with its dual outfalls either side of Conisholme, and the fact that the Long Eau and Great Eau were originally separate rivers (Image: Cambridge University, CC-BY-NC 3.0). 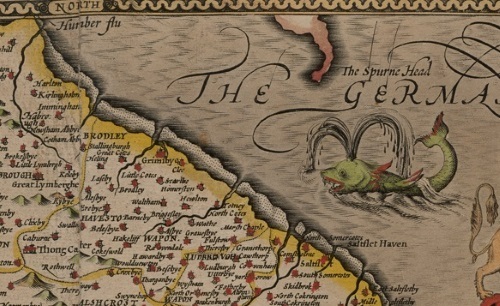 Detail from John Speed's early seventeenth-century proof map of Lincolnshire, showing the coastline of north-east Lincolnshire and a whale menacing the Humber estuary! (Image: Cambridge University, CC-BY-NC 3.0). 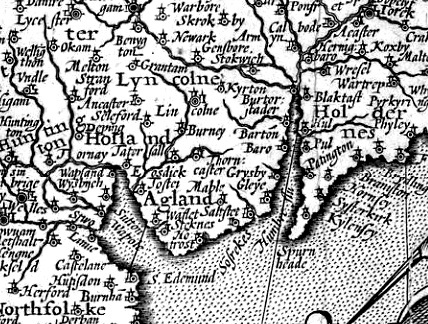 Extract from a map of Britain by Johannes Janssonius, printed in 1621 and reprinted in 1630, one of the last maps to feature Agland/Ageland as a district-name located in eastern Lindsey. 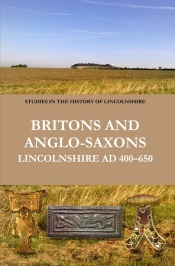 As to what the name Ageland/Agland might mean if it is in fact a genuine north-east Lincolnshire district-name that somehow largely avoided being recorded outside of maps, this must remain a matter of speculation in the absence of early evidence. However, if it is a real name, then the second element might be either OE land or ON lundr, both of which appear in early district-names in the form 'land' (cf. Rutland/Holland & Framland/Wayland), with the first element potentially then being either a personal name or perhaps OE for oak, āc/āca (gen. pl. ), with c > g as in medieval and later spellings of other place-names, cf. 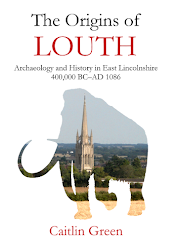 for example Acthorpe nr Louth (Aggetorp in 1200 & Agthorp in 1485–96) and Agden, South Yorks & Cheshire East? For what it is worth, Ageland does make an appearance in medieval surnames, which would seem to add weight to the case for Ageland being a genuine place-/region-name—see, for example, the fourteenth-century merchant and bailiff of York named William de Agland/William Ageland (Image: BnF). The text content of this post and page is Copyright © Caitlin R. Green, 2015, All Rights Reserved, and should not be used without permission.